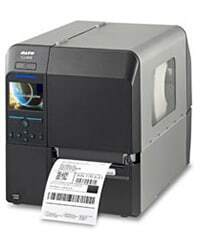 Trusted dependability for 24/7 mission critical operations, SATO’s Industrial bar code printers are the hallmark of printing products for harsh environments and applications. Our printers are field tested to ensure you the best print quality possible in Barcode, Text, and RFID encoding of labels, tags, invoices, packing slips and e-commerce or compliance labeling. Product identification, warehouse bin labels, cross dock and routing labels are only a few of the bar code labeling applications customers trust everyday to SATO.